Both run Android. 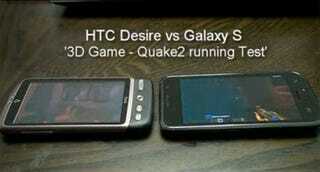 Both have lightning-fast processors (the Galaxy S a Hummingbird/Power VR, the Desire a Snapdragon/Adreno). Both can play Quake 2. But which handles better? See the side-by-side comparison below. I won't give too many clues away, but I've got to say that I'm pretty disappointed with the outcome. I'm like a proud parent who expected much greater things of her child—even if the initial tests suggested one day I'd be sobbing into my hanky, wishing I'd backed the other horse. Sorry, I'm so upset, I'm mixing up my metaphors.